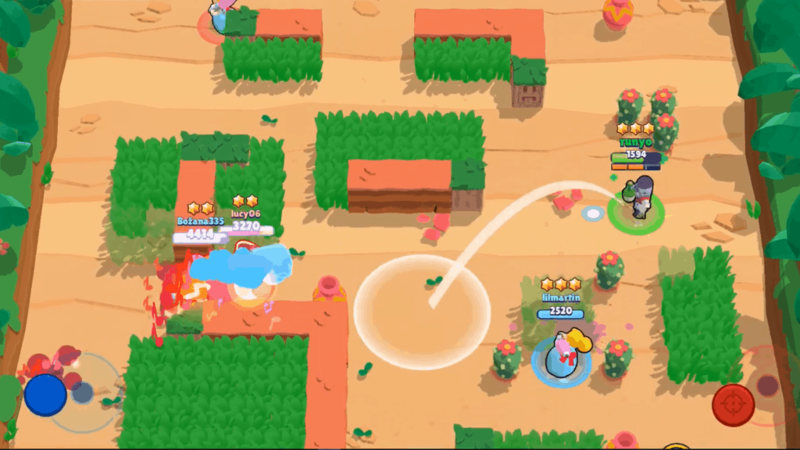 Brawl Stars is a popular online MOBA style mobile game made by Supercell. Players choose a brawler and go up against other players in a range of different game modes. Each brawler comes with its own unique abilities and play-style. In this guide, we go over basic must-know knowledge about the game and its features, as well as tips and tricks for winning. The controls in Brawl Stars are very simple. You only have three different inputs you have to use. On the left side of your screen, you control your brawler’s movement by holding down a finger and dragging it around. On the right side of your screen, you control your basic attack. You can either hold and drag your finger to aim your attack, or simply press it to attack instantly in the direction of the closest enemy or objective. This isn’t a good idea to use, however, if the enemy is inside a bush, just about to enter one or if there is an objective very close to you. In the right side of your screen, there is a circle with a skull on it. This is your super ability, which you charge by dealing damage to opponents with your basic attack. Once your super is ready, the circle turns yellow which indicates that it is ready to use. You just have to press or hold and drag the circle with the skull on it instead. Each brawler has its own two abilities, a basic attack, and a super attack. Your basic attack the basically your filler ability you will be spamming throughout the game. You super attack is usually a powerful finishing move or a powerful supportive ability. In most cases, it is a great idea to save your super for the right moment, as it often is able to turn a fight. You are able to hold up to 3 charges of your basic attack. New charges recharge automatically at a certain rate while you are not attacking. Your super attack charges by you dealing damage to enemy brawlers with your basic attack. Every brawler in the game also has something called star power, which enhances the brawler or its abilities. To unlock star power on a brawler, you have to rank it up to rank 9, then find that specific brawler’s star power in a brawl box. There are tons of different characters, known as brawlers in Brawl Stars. At the time of this writing, there is a total of 24 brawlers. Each comes with its own unique playstyle, set of abilities, and stats. There are two primary ways of unlocking new brawlers, through the trophy road and by opening brawl boxes. Learn more about unlocking more brawlers. You earn trophies and rank exp for a specific brawler by playing games with it. To upgrade brawlers and make them stronger, you have to collect power points and coins. Powering up your brawlers is essential, especially at higher rankings. We’ve made a guide about upgrading your brawlers. Each brawler has three stats, their basic attack damage, their super attack damage, and their health. 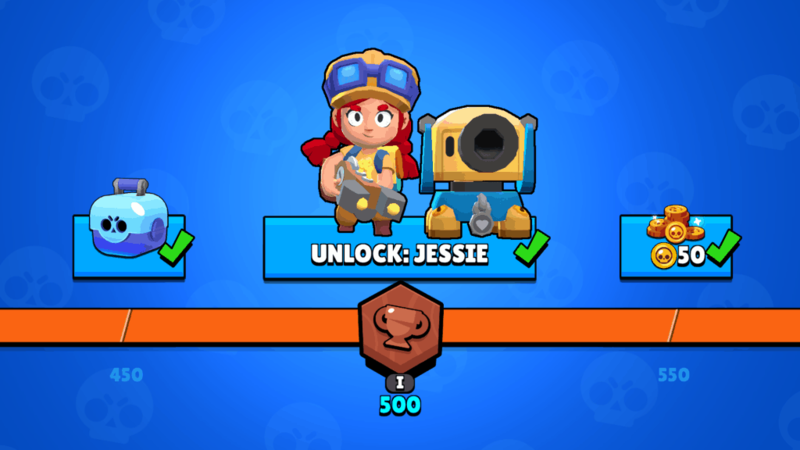 You can increase each of these stats by upgrading your brawler. Check out all brawlers in the game, their attacks, and stats in our all brawlers list. You earn or lose trophies each game depending on your rank, whether you win or lose, and the number of trophies you already have. Trophy count is among other used as a measure of rank in Brawl Stars, as you are queued up against other players with a similar trophy rank to you. Besides being a measure of rank, players earn rewards including new brawlers by collecting trophies. You can see all the rewards earned from collecting trophies in the trophy road. Learn more about farming trophies in our trophies gathering guide. The second main way to get rewards including new brawlers is by opening brawl boxes. 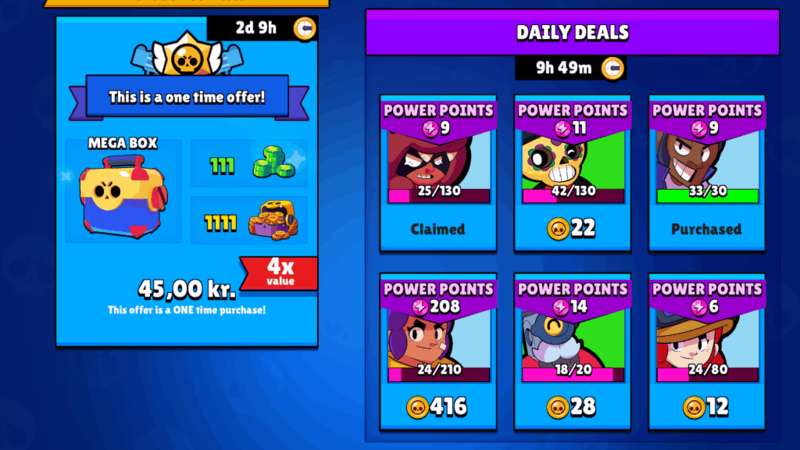 There are different ways to earn brawl boxes, such as collecting 100 tokens or through the trophy road. Besides containing new brawlers, you’ll find coins and brawler power points inside the brawl boxes. Occasionally, you’ll also receive a small number of gems and event tickets. Check out our guide on how to get more brawl boxes. 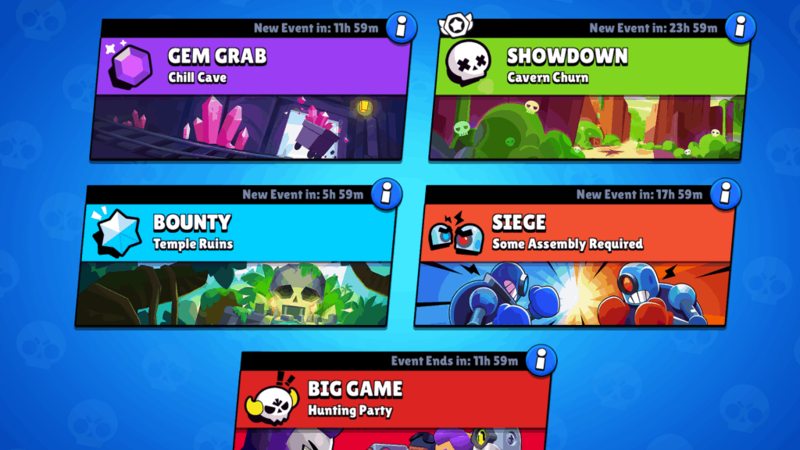 There are several game modes, known as events in Brawl Stars. Most events are team based with two teams of 3 battling each other. Each game mode comes with its own objectives and unique play styles. Brawl Stars also has its own battle royale mode, known as showdown. 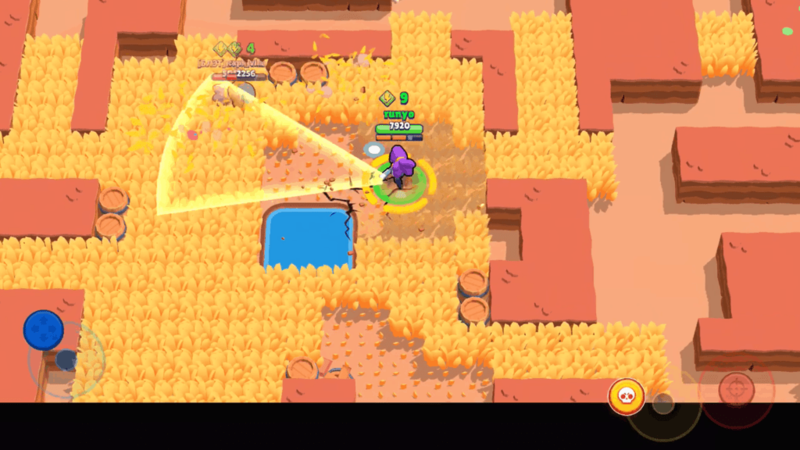 In showdown, you can either play solo or duos. At the time of writing, there are a total of 9 game modes in Brawl Stars, check out all of them, including tips and tricks in our all game modes list. 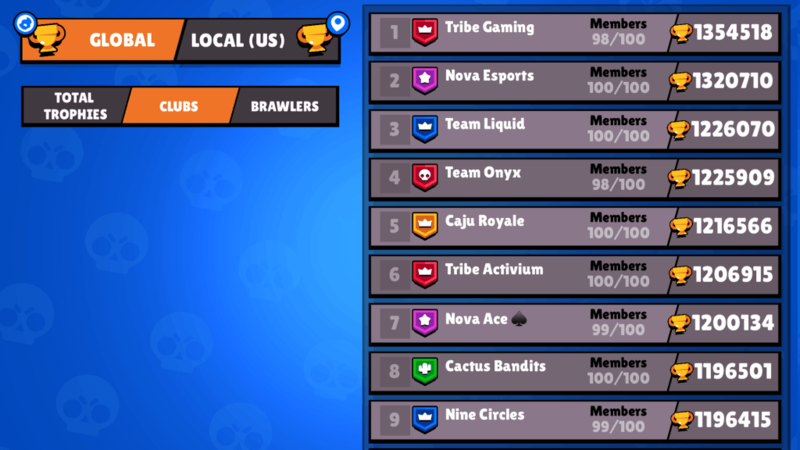 In Brawl Stars, players can join clubs, which are a group of players. Many players enjoy being in a club because of the social aspect, being able to find others to play with, and potentially making new friends. Some clubs are invite-only, some are free for everyone to join, and some have a specific trophy requirement. Getting to join a high tier club might help you get recognized in the pro scene, which is one of the reasons a lot of players wish to join a top tier club. Learn how to join or even create your own club in our clubs guide. Besides gathering your daily 200 tokens, you should take advantage of the free daily item. Inside the shop tab, under the daily deals section, you’ll find a bunch of things you can purchase with coins. However, there is also a free item added to this section each day. 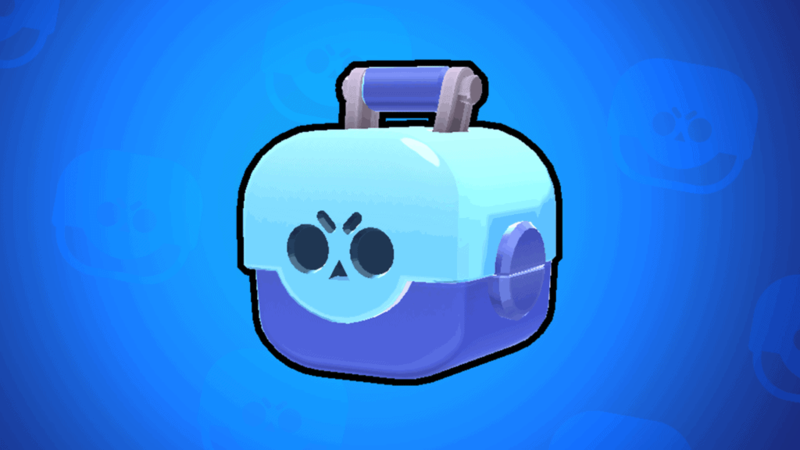 This free item is often some power points, but can even be a brawl box. Be sure to take advantage of this free daily item. Considering your playstyle and what role you should take on is a great way to improve you overall chances of winning in Brawl Stars. Each game mode has its own meta, which is crucial to understand if you want to compete in the big leagues. In Gem Grab for example, teams often assign a player the role of gem carrier. This player’s sole purpose is to hold all the gems, and make sure not to be eliminated. Their teammates’ job is to support and cover for the gem carrier. In most game modes, your team should contain a long-ranged damage dealer, a support/healer, and a tanky brawler. 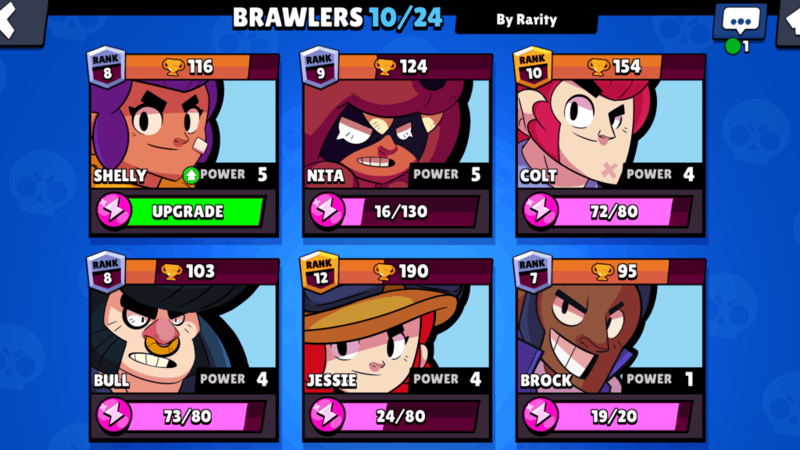 Besides thinking about strategy, you should also consider what brawler you choose to play as some are better than others, even though Supercell aims to keep all brawlers balanced. Learn which brawlers are the best in each game mode in our best brawlers tier list.